This is the 2nd in a series of posts on the 2012 Beer Bloggers Conference that took place in Indianapolis, Indiana over the weekend. Fermentedly Challenged and over 125 other bloggers and beer industry representatives participated in the 3-day conference. 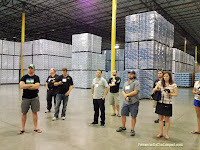 And yes, we did do more than just taste and sample a lot of great beer. Here's the lowdown on the non-stop talks, tours and events that took place. Despite being out til the wee hours the night before, the bloggers started their 2nd day of the conference at 9:30am and had a very long day planned for the attendees. Be sure to click on any image below to enlarge. 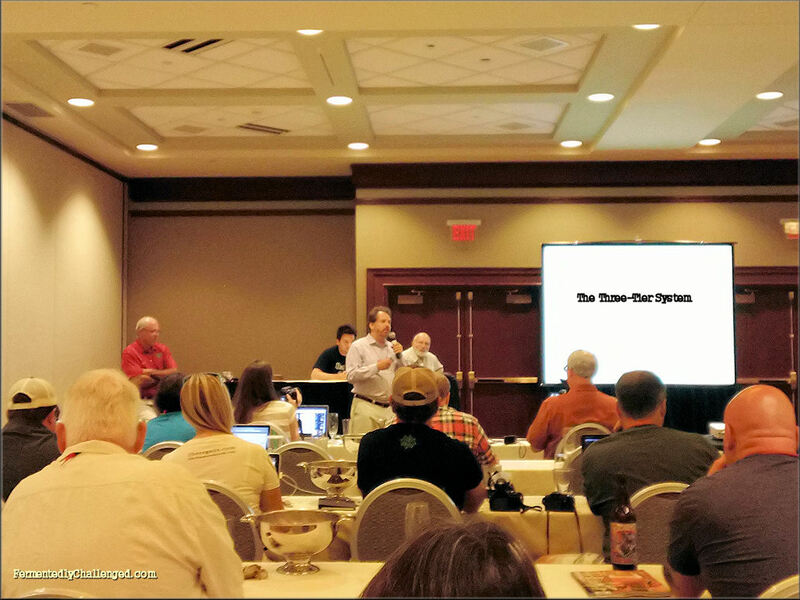 The first session of the day was entitled: The Three-Tier System and was geared towards giving bloggers some insights into how history and present day conditions shaped the way breweries are allowed to sell and distribute their beer. 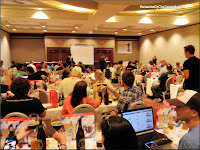 Members from the wholesalers, retailers, and brewers were on a panel that gave some eye opening background on what it's like to get beer from creation into the hands of the consumer. Panelists included: Dan Kopman of Schafly Brewing, Jim Schembre from World Class Beverages (distributor), and Jordan Huber from the Beer Sellar (retailer). 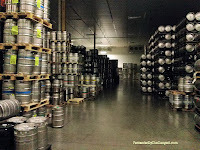 Quick Facts: Did you know that distributors track and ship over 13,000 different beer products (SKUs) in the USA? Over 78% of that is of the Bud-Miller-Coors variety. That accounts for 94% of the total amount of beer consumed in America. That leaves just around 6% for craft beer. Despite having a 1.2% drop in overall beer consumption in 2011, craft beer sales rose in the double digits (over 10%). The wholesalers in the industry aren't well known by the consumers. Consumers tend to only see the end product at their local store, bar or brewery. It literally takes a well coordinated army of people to get beer distributed to the thousands and thousands of retailers across America. 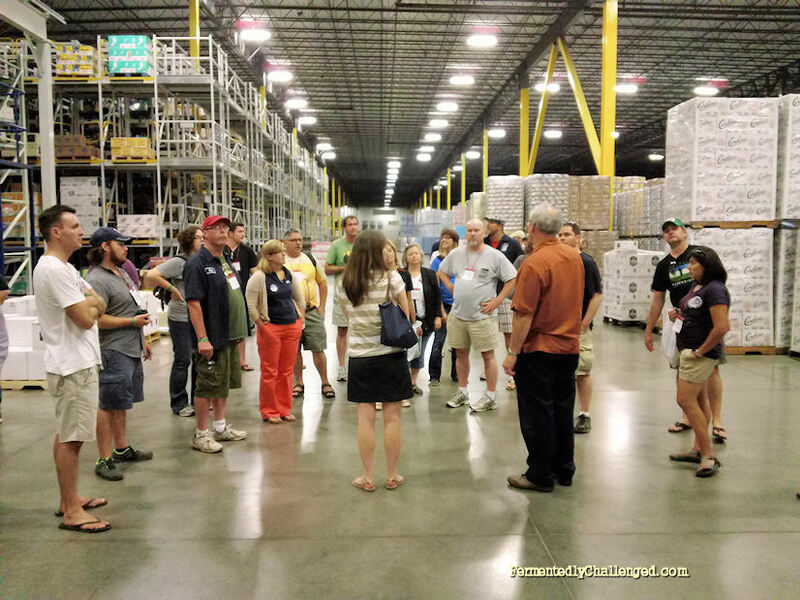 (More on that during a wholesaler facility tour below). At 10:30am, the next panel began covering Networking with Local Breweries, Distributors, and Retailers. Neal Taflinger from Bite & Booze and Tiffany Adamowski from 99 Bottles. 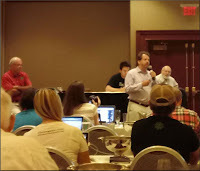 This panel let is be known that we beer bloggers are essentially Beer Pimps, we help the 3-Tier members promote the beers we cover. Tiffany, a retailer, reminds herself often that retailers are basically legalized drug dealers and that certain state's laws can be quite restrictive on what they can and cannot get, beer wise, into their stores. 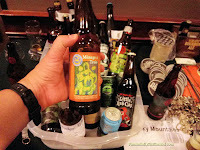 A suggestion for beer bloggers who give a great review on a certain beer, they should also be giving suggestions on "If you like this beer, you may also like these others similar beers". At least we can give readers clues on other beers to ask for if the one they want isn't stocked at their favorite store. (Good suggestion). The next panel at 11:30am was all about International Beers featuring Chad Wodskow from Pilsner Urquell and Jim Blockinger from Merchant du Vin. In this segment we explored what an international brewer and a local importer go through to get their beer from overseas to America with the most freshness preserved. Two samples of beer were poured including Pilsner Urquell (in a nice glass by the way). Turns out one of the top beers in my list of Best of the Conference turned out to be Petrus Aged Pale, a oak-aged sour ale from Brouwerij Bavik in Belgium. Loved that oaked sour twang in that blonde ale! Look for that brew in catchy new packaging for the USA. 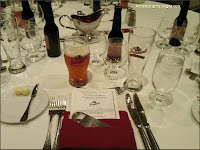 It had been a busy morning already and Lunch was to be a food and beer pairing delight thanks to Jacob Leinenkugel Brewing Company. Lunch included several beers from Leinenkugel including samples of their Hefeweizen, a Summer Shandy (beer + lemonade combo), and 2 beers from their Big Eddy series - a Double IPA and a Wee Heavy. Except for the Hefe, each beer was paired with a different part of the meal. I loved their Double IPA and Wee Heavy the best during the meal. A rep from JLBC was on hand to talk about the beer and why it was selected to go with that particular pairing. 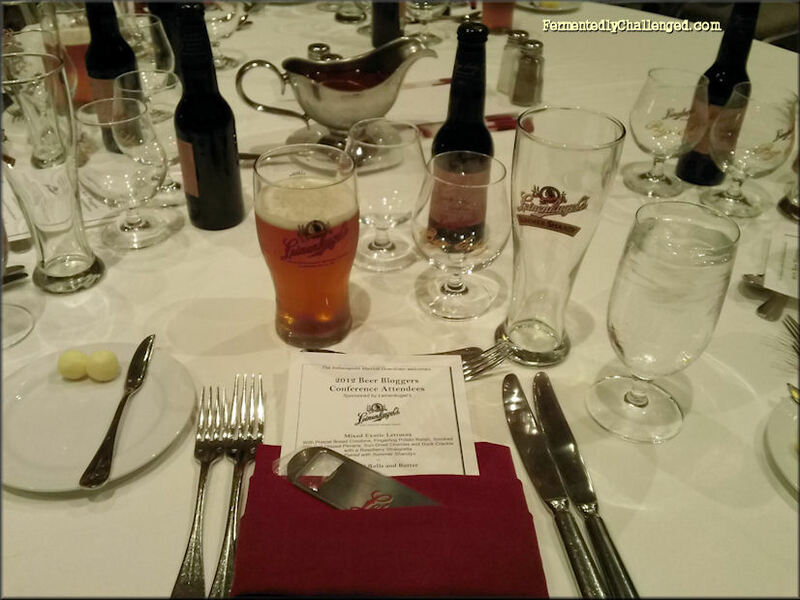 Again, special glassware, a printed menu and a branded bottle opener was provided that added a lot to the overall experience of the beer luncheon. 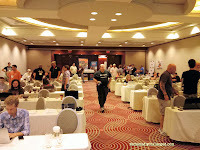 While the next session, Connecting to Beer Consumers Via the Web, was going on featuring the sites such as Taphunter, Pintley and the upcoming BeerBloggers.com gave a presentation, I snuck out to do a radio remote interview with the guys from the Colorado Craft Beer Show (AM 760 Denver). Fermentedly Challenged gave an update to listeners back in Colorado about what was happening at the conference. Follow the link to the podcast from that show. My segment is near the end of hour 1. After the interview, I headed back to the conference for the next segment. The last session of the conference day was the Comparative Beer and Glass Tasting with Speigelau. Speigelau is well known for their unique glassware that allows beer drinkers to get the full taste and aroma sensation of a good craft beer. A rep from the company was on hand to lead us through comparing beer in a regular thick pint glass differs from style specific glassware from Speigelau Samples of Brooklyn Brewery's beers were sampled both in a common pint glass and in a specific shape glass for the style of beer we were sampling. During this session we tasted 5 different Brooklyn Brewery beers including Local 2, Black Ops, Sorachi Ace, East India Pale Ale and Brooklyner Weisse. I was shocked how much better the beers tasted in the Speigelau glasses and how much colder they stayed in the thinner glass. Garrett Oliver was on hand as well to talk about each of the 5 beers from his brewery. Think we were done for the day? HELL TO THE NO!! That was only the beginning. 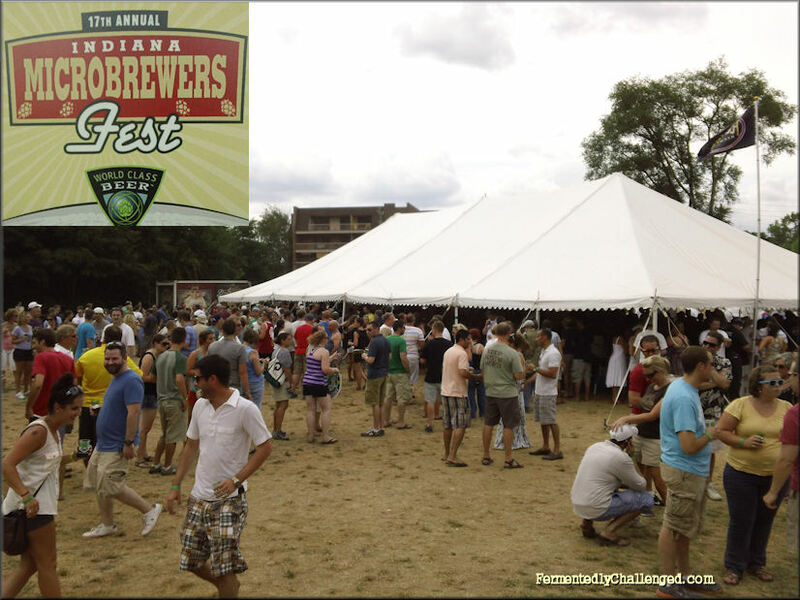 At 4:15pm all 100+ bloggers piled into two large buses and headed over to the 17th Annual Indiana Microbrewers Festival going on on the north side of town at Optimist Park and the Indianapolis Art Center. A thousand or so beer fans were on hand to sample beers from dozens of breweries from Indiana and neighboring states. It was a hot, yet overcast day and everyone had a couple of hours to explore the beer tents, taste some local food treats, and also tossed a few kegs through the air in a friendly competition. There was also a fine cigar booth there and you could find a lot of people pairing beer with cigars at the fest. It seemed that we were just getting started when we ran out of time and had to load back into the bus. This time, however, we were headed for another destination with a lot of beer. 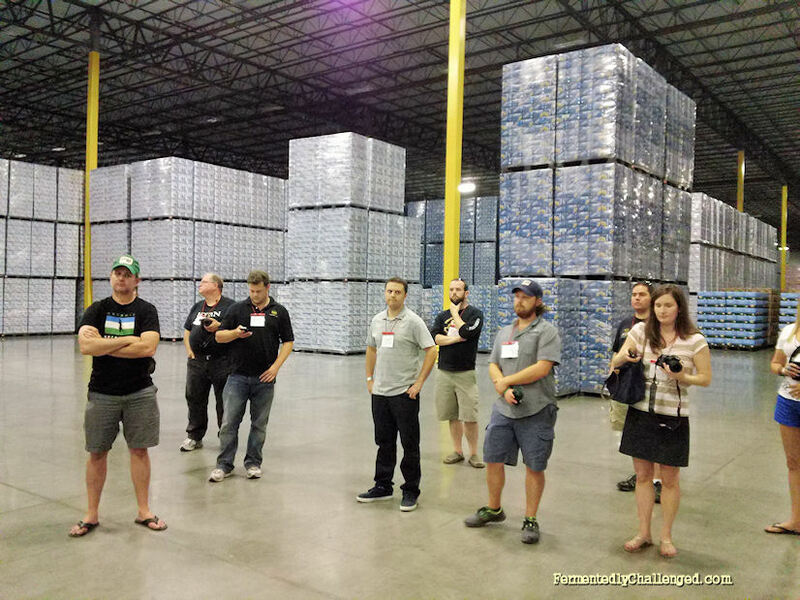 The dinner hour included a catered meal at one of the largest beer distributor warehouses in the country - Monarch Beverage Company, part of World Class Beer in Indianapolis. 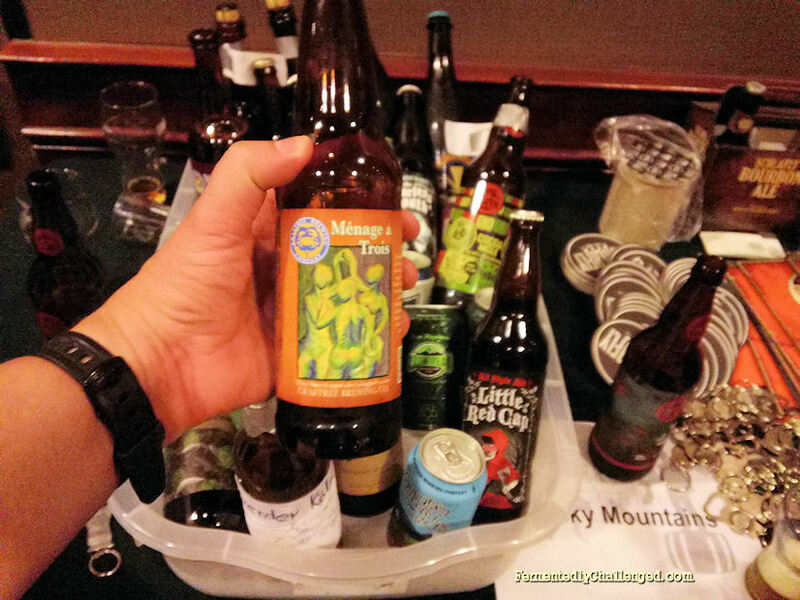 The meal featured tastings of several different craft beers from around the region and globally. 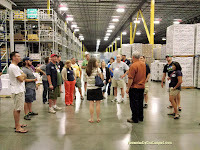 After the dinner we got a personal tour from the reps from World Class Beer. This mega warehouse stores and distributed literally mountains of beer with some of the most highly advance robotic arm and conveyor systems I've ever seen. 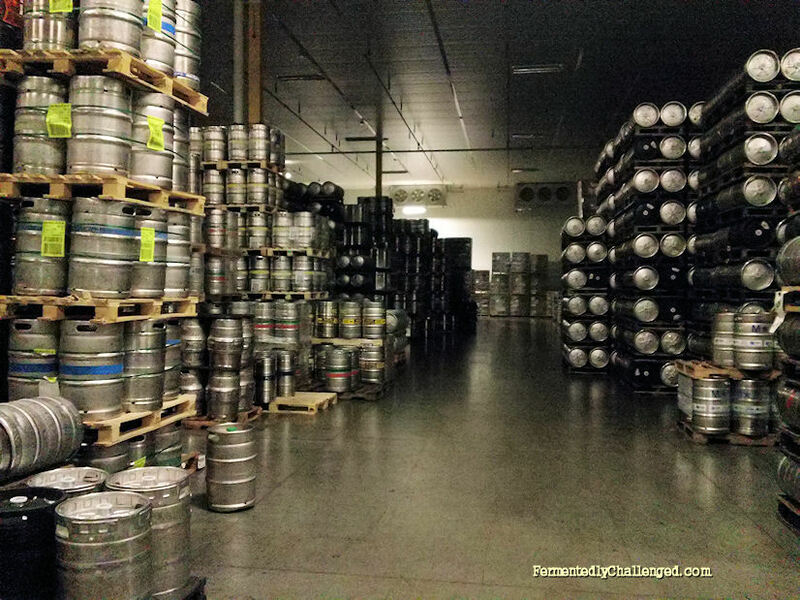 Granted, over 95% of the beer in that warehouse was of the Bud-Miller-Coors variety, but we also saw plenty of craft beers in storage there in both bottle and keg. Surprisingly enough, the entire warehouses inventory was only big enough for a few weeks or orders. I couldn't imagine restocking that entire place every 3 weeks. Just mind boggling. The attendees spent until just after 1:00am when we were told the conference room was shutting down for the evening. After obtaining a bell hop dolly from the front desk, we carted all of the remaining open beers back to a cozy spot in the main lobby and continued the Night of Many Bottles until the wee hours of the morning. All I can say is: What happens in Indy stays in Indy. The party lasted til around 2:30am or later. Whew! Many of us were in for a rude awakening the next morning - that was for sure. Unfortunately (or perhaps fortunately), my camera battery wore out at this point - so no pictures from that late night party will be posted here. All I can say is, wow, what a selection it was and oh man sooo many good beers. The spoils were eventually divided up amongst the bloggers the next day. Look for Part 3 - the final day - to be posted next. 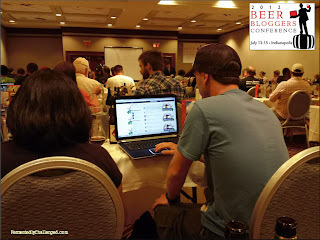 - Beer Bloggers flick to Indy for 2012 conference.